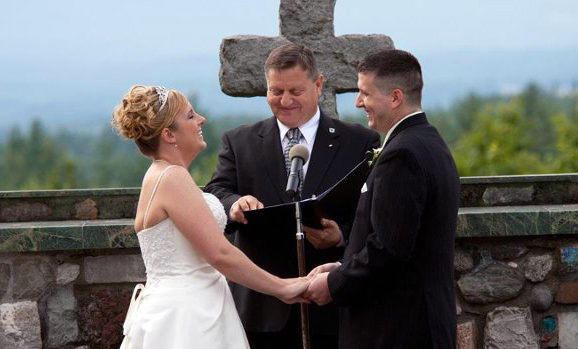 New Hampshire Wedding Officiant — Voted #1 Wedding Minister in NH! Rev. Ernie performs extraordinary wedding ceremonies throughout New England. Let's discuss how Rev. 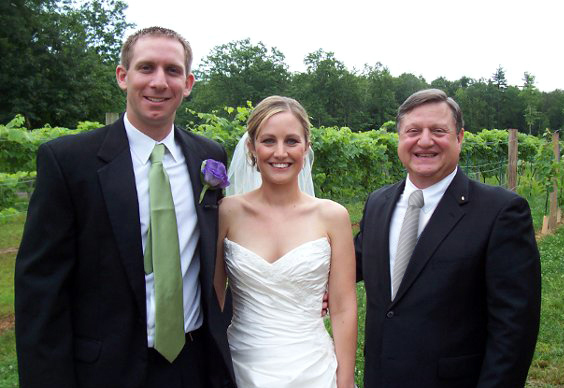 Ernie can help make your special day a reality. Voted one of New Hampshire's Best Wedding Officiants! Thank you to all of the wonderful couples who voted for me. Your gracious support means the world to me, and I'm honored to have been a part of making your special day one you'll treasure for the rest of your lives. Now you want to make sure everything will be perfect for your upcoming wedding. As a Certified Wedding Officiant and Interfaith Minister with over 35 years of experience, it would be my distinct pleasure to help you celebrate the most important day of your lives– Your Wedding Day! Whether you're looking for a ceremony that is elegantly formal and uniquely personalized, or informally simple and short (or somewhere in-between) I will work with you to make sure that your wedding ceremony is exactly what you want it to be: a reflection of the uniqueness of the two of you, and a celebration of love, joy, and commitment that you and your guests will remember for many years to come. I firmly believe that two people who love each other and wish to commit their lives to one-another should be allowed to do so. They should not be denied happiness because they are not affiliated with a church or organized religion, are of different religious beliefs, or are of the same gender. Therefore, I will gladly officiate the joining ceremonies of all who ask and are legally entitled. I am pleased to offer my services throughout Southern Vermont, Southern Maine, most of New Hampshire and Eastern Massachusetts, although I will certainly consider traveling further upon request. If you are not sure if your location is covered please ask. If you are coming to New England from another state and wish to have me perform your wedding while you are here, I would be honored to do so and will gladly assist you with the process by phone and email. If you would like me to perform your wedding in a state not listed above, please email me with the specifics and I will be happy to explain the process. VIP Weddings are always welcomed; confidentiality is always assured. I offer several ceremony packages designed to fit most every taste and budget. In general, my ceremonies range from $200 for an elopement near my home, to $300 for a more formal ceremony. For those who want something more, I am honored to offer beautifully elegant and uniquely individualized, Semi-Custom and Custom Written ceremonies starting at just $400. In many cases these prices can include travel, and may include my attendance at your rehearsal, however, in order to quote a price for your specific ceremony I will need to know more about your wedding preferences, requirements, and location. E-mail inquiries are always welcomed. Special discounted pricing is available to all members of the active military. If you haven't already done so, please check out my About Me page to learn more about my qualifications and abilities to perform the perfect wedding ceremony for you! Reverend Ernie with Kaitlyn and Nick after their ceremony.